If you’ve been consumed in the gaming world for the last four decades, you’re likely familiar with Atari, maker of popular game consoles in the 1970s and 80s. Believe it or not, the company is still around, re-developing some of its classic titles, as well as its very own controller, for the magical Apple device: iPad. Many of the most successful Atari games in its age have been packaged in a single app, known as “Atari’s Greatest Hits”, which is available as a free app on the iOS app store, with a few games available upfront, such as Missile Command. In addition, there are 25 other game packs with several other great games, available for $0.99 each. By default, all the games are controlled by on-screen controllers, which seem to work rather well, but what if you’re looking for a more integrated, and perhaps more realistic arcade experience? 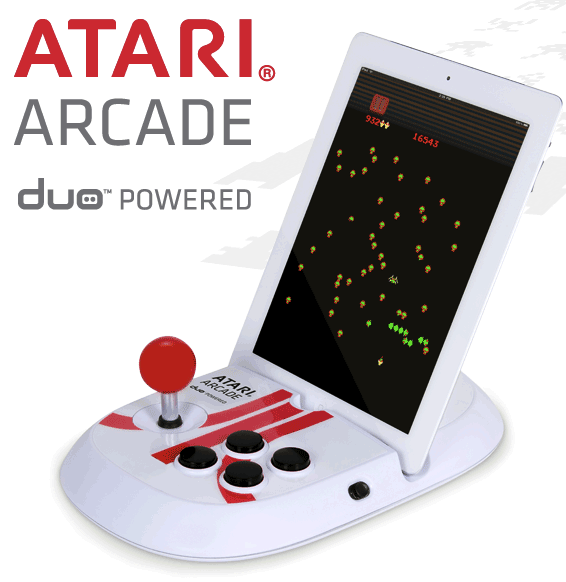 Thankfully, there’s a hardware controller that does just that, known as the “ Atari Arcade-Duo Powered”. This custom controller, just like any other accessory, plugs right into the iPad’s dock, making it much more natural to interact with games, even though some of them are well over 30 years old. The device is current labeled as “coming soon” on its website and there’s little we know about the accessory’s feature set as of yet, although the available pictures give us clear hints. This accessory includes all the main buttons, laid out the way they were on controllers from the 80s and 70s, needed to play all classic Atari games. It also seems that this controller will work in both portrait and landscape mode, suggesting that it will also be able to interact with the device via Bluetooth, not only while it’s docked. This is not the first time we’ve seen classic gaming come to life on brand-new Apple devices. Not too long ago, we reported on JOYSTICK-IT, a small metal joystick that could be attached to the iPad’s screen, making it easier to play classic games such as Pac-man right on your device. Earlier this month, we overviewed Joypad, an app for iOS with classic game controls that allows users to remotely interact with classic titles on the Apple TV. While classic games likely won’t be as entertaining as the latest Angry Birds level pack, who would have guessed 30 years ago that we would still be talking about them today?